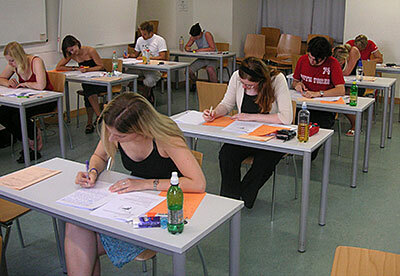 The placement test is necessary in order to: evaluate the student's level of proficiency in French and determine which course is the most appropriate. Who has to take the Placement Test? All students (including complete beginners) wishing to take a French course are required to take a placement test. All French courses given at the French Language Centre (FLC) have limited enrollment and placement tests are mandatory for all students. Students currently enrolled in a French class at the French Language Centre (FLC) or students who have completed a course at the FLC in 2016-2017 and/or 2017-2018 do not need to take a placement test to enroll in another FRSL course. To know which course have been recommended for you, please refer to the recommandations de cours found on the MyCourses website (Notes/Gradebook section) of the last FRSL course taken. Please register as soon as possible. If the recommandation de cours does not appear in MyCourses or if you experience any problems registering, please send an email to flc [at] mcgill.ca and include your McGill ID number, the last FRSL course taken (course number, CRN as well as the term/year and the professor's name), the course number and the CRN of the course you wish to take (e.g. FRSL101, CRN 9230) and potentially a screen shot of the error message. The secretary will then tell you which course(s) you can register for and issue a permit to register. Special students, visiting students, or exchange students have to take the placement test on regular testing dates. If you are not available for testing on those dates (only for students wishing to take a summer course), please send an e-mail to flc [at] mcgill.ca. Graduate students who wish to take a course at the FLC for the first time must obtain a letter of permission signed by an authorized person in their faculty or department (e.g. a program supervisor) and keep it for their record. Failing to obtain a signed letter of permission may lead to credits denial by their faculty or department. Therefore, it is the students' responsibility to get this letter. Graduate students who wish to continue their studies at the FLC must contact the secretary regarding this matter by e-mail (flc [at] mcgill.ca). Students might need to show a copy of their previous French language course(s) transcript. After writing the online placement test, students have to meet an evaluator for an interview. Dates and places are advertised under Placement test dates: https://mcgill.ca/flc/registration/placement-tests/placement-tests-dates-0. If you speak French or have some French knowledge, you will have a short interview in order to evaluate your oral skills. All students have to go through this step in order to have a course assigned. Having then an overview of your French skills (speaking, writing, listening and reading), the evaluator will assign (a) course(s) appropriate for your level and will write this information on a paper slip. Once you have finished the online test, the interview and received your paper slip, you might have to wait up to 1 business day to register on Minerva. If you still cannot register after 1 business day, contact flc [at] mcgill.ca. If you are a total beginner (according to the online placement test), you don't need to meet an evaluator. Beginners won't receive a paper slip. Once you have finished the online test, you might have to wait up to 1 - 1.5 week to register on Minerva. If you still cannot register after this period of time, contact flc [at] mcgill.ca. All students (registered) who want to take a French class have to attend class every day from the first day of class to the last day of the add/drop period in order to stay in the class. Since enrollment for our courses is limited, a student who is absent from class without sending an explanatory e-mail to the instructor will be asked to step out and give the spot to the next student on the Minerva waiting list. All students are expected to attend class without fail during the add/drop period in order to retain their places. If you decide to drop your French course(s), please do so as soon as possible on Minerva in order to allow another student to register for the course(s). Check Minerva as often as possible and keep trying to register. Some students may change their minds and may drop the course before the class starts. Students on Minerva waiting list (if available for the course) have to show up every day from the first day of class to the last day of the add/drop period to stay on Minerva waiting list and be potentially added to the official class list if any places become available.